CPAP or Continuous Positive Airway Pressure involves the continuous positive pressure in the lungs. The positive pressure is given at constant flow to generate positive pressure in the lungs and keep the airways open. In the use of CPAP, patients are the ones who initiate their breaths. CPAP can be used in the hospital setting as well as at home. It also contains heated humidifiers to prevent drying of the nasal and oral mucosa as the mild pressure from the CPAP is given. The continuous pressure keeps the airways open and limits the need for intubation and become a weaning method for extubation. Continuous positive airway pressure was developed initially for the use of neonatal intensive care unit patients, but is now used in varied cases of patients. CPAP is used in patients with no problems on the level of consciousness or neurologic symptoms because breathing in CPAP is still initiated by the patient. The use of the interface such as a nasal cannula or face mask becomes uncomfortable for patients because it causes irritation of the nasal mucosa or the skin around the face mask as CPAP side-effects. This can be managed by application of lubricants on the nasal cannula that comes in contact with the nasal mucosa. The use of face mask liners also prevents irritation of the skin on the face as CPAP side-effect. Patients who have vigorous airflow requirements also may experience nasal congestion symptoms as CPAP side-effects because of high oxygen volume that passes through the nose. This irritates the nasal mucosa leading to increase in mucus production. Patients often adjust to this over a period of weeks. These CPAP side-effects can be managed by using humidifiers to reduce nasal dryness that may lead to rhinitis and congestion. The occurrence of nasal congestion may lead also to sinus congestion that may cause headache upon awakening as CPAP side-effects. Management may include taking analgesics to relieve headache and administration of prescribed decongestants. The high pressure that goes inside the nasal cavity may also pass through the Eustachian tubes. Eustachian tubes are the connection between the nasal cavity and the ears. When moisture accumulates in the tubes a result of CPAP use, it may cause infection; however, this CPAP side-effect is uncommon. This CPAP side-effect can be prevented by ensuring that the tubes and interface are clean. It requires washing and disinfection every day. The high pressure that enters the Eustachian tubes also goes behind the cochlea where pressure may build-up. 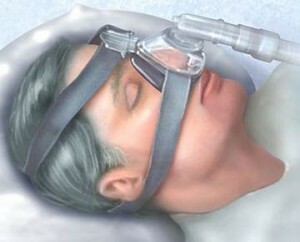 As a result, the patient may experience pressure and pain inside the ears as CPAP side-effects and may affect hearing. This CPAP side-effect can be managed by adjusting the pressure as prescribed by the health care provider. Oxygen use may cause drying and irritation of the mucous membranes as CPAP side-effects. This can be prevented by using heated humidifiers to moisturize that oxygen that goes inside the nasal cavity and may escape the face mask and may have contact with the eyes. Face mask should also be fit properly to prevent the escape of high oxygen pressure that may irritate the eyes. The use of CPAP mask for prolonged periods leads to movement of the jaws and teeth backward. This phenomenon may lead to temporomandibular joint disorder (TMJ). This CPAP side-effect can be managed by using properly firing mask or changing of the appliance to other possible interfaces such as using a nasal cannula. In case of face mask use, it should not fit too tight to prevent pressure on the teeth and jaws to prevent this CPAP side-effect. Patients using CPAP may suffer difficulty falling asleep because of high pressure. The remedy for this CPAP side-effect is by the use of pressure relief equipment that lowers the pressure as the patient sleeps and gradually increases to the desired pressure when the patient is already asleep. Other pressure relief equipment also allows reduction of pressure as the patient exhales and returns when the patient inhales. Patients may also experience anxiety and claustrophobia resulting from the use of face mask as CPAP side-effects. CPAP increases the pressure that is also preset upon exhalation. Because of this, the patient will have difficulty exhaling because of the opposing pressure from the CPAP. Patients who develop claustrophobia may need changing of the interface from a face mask to another interface. CPAP may also lead to bloating and distention as CPAP side-effects. These result from the air trapped from entering the trachea which then enters the stomach. These CPAP side-effects can be prevented by sleeping in a neutral position to prevent airway obstruction. Because of these CPAP side-effects, patients often become non-compliant. However, CPAP still remains to be important in the management of sleep apnea and other respiratory conditions because it allows continuous positive pressure that eases breathing and preventing lung collapse. CPAP side-effects can be prevented or managed to increase the compliance of patients.